In the discipline of archaeology, the term “monumental architecture” refers to these edifices whose great size markedly differentiates them from other structures of the same cultural group, and most significantly, the scale and elaboration of their construction cannot be accounted for merely by their functional purpose (Trigger 2003: 564; Pollock 1999: 174). In the discussion of early complex societies, monumental architecture is particularly important since it is a ubiquitous feature of the development process of most (if not all) of the early, pristine states. Equally interesting is the fact that in most of these states, there is a commonality in the forms that monumental architecture takes – namely temples, palaces, tombs, and fortifications (Trigger 1993: 75; Trigger 2003: 565). Different states and different types of states put special emphasis on different types of structures, but in all cases, their nature and function is telling of an underlying relation among monumental architecture, leadership, and ideology. This relation along with the aforementioned ubiquity of monumental architecture in early states has raised the question of its potentially critical role to the process of state development, which is the topic that this essay tackles. In the first part, I will focus on the potential contribution of monumental architecture to the creation and support of state ideology and by extension of a dominating leadership. In the second part, I will address the question of whether monumental architecture can be considered as a vital component of the process of state development. The last part will consist of a case study which will contribute to the points and arguments which will be raised throughout the essay. A concept of paramount importance in the discussion of monumental architecture is that of state ideology. Yoffee (2005: 17) concisely defines state ideology as the idea that “there should be a state”. In the present discussion, therefore, state ideology is understood and will be explored in its Marxist sense: the process through which a socially dominant group proclaim its own self-beneficial interpretations of the workings of the world, not only as the natural way, but as the only possible way of existence and societal organization. In this system, the ruler plays a structurally vital part as the intermediary between the gods and the common people, as the link between the supernatural and earthly reality, and by extension as the guarantor of cosmic order. A fundamental aim of state ideology is to take the increasing social inequality which ubiquitously characterized every society that developed into a state and legitimize it as a natural condition of being, while institutionalizing the dominating position of leadership (Ball 1991: 130; Matthews 2003: 141; Pollock 1999: 173; Reiman 1991: 158; Trigger 2003: 486; Yoffee 2005: 32; 35; 39). An equally important task of state ideology was the integration of the diverse social and ethnic groups, of which the state was comprised, and the creation and communication of inter-societal relations of power (Yoffee 2005: 33). The creation and maintenance of symbols was one such vehicle for social integration and a source of political power which leadership sought to control. Religion and its symbolisms were intertwined with state ideology in the same way that no clear distinction existed between political and religious power, or between secular and religious architecture, in early states (Fitzsimmons 2007: 65-67; Kemp 2006: 61; Trigger 1993: 76). This is context in which monumental architecture was created. The mechanisms of transmission of state ideology in early states were various: art, royal iconography, literature (Pollock 1999: 173). Monumental architecture, however, was both one of the most impressive and most lasting of these. Its inextricable relation to state ideology is illuminated by its very definition: the size and elaboration of structures such as the Egyptian pyramids and the Mesopotamian ziggurats far exceeded what was sufficient for them to be utilitarian, and were dictated by a spectrum of symbolisms which these structures were created to project. In the most fundamental level, monumental architecture was a testimony to the power of the ruler which, in this case, was translated into access to resources and management of labour (Trigger 2003: 564). 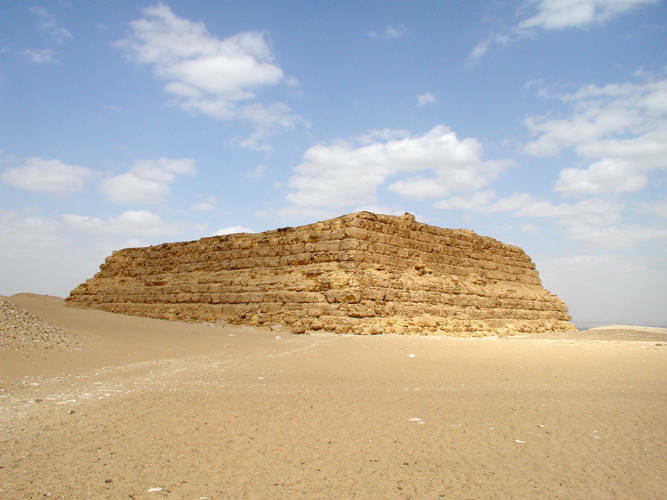 Access to resources is not solely related to the abundance of construction material that was needed for such colossal projects but also to the special material choices which invariably accompany the emergence of state monumental architecture: the most poignant example is the Stepped Pyramid of the 3rd Dynasty ruler of Egypt Djoser, which is the first monument entirely made out of stone (Kemp 2006: 101). Even more important than resources was the management of the workforce that laboured for the construction of these structures. While it is difficult to calculate the exact amount of labour which was needed (Pollock 1999: 179), even an approximate estimation elucidates the tremendous power which was required in order to control, organize, and command such a workforce: the Anu Ziggurat at the Mesopotamian city of Uruk-Warka, which was constructed during the late Uruk period, would require 1500 labourers to work for 10 hours per day over a period of 5 years for its completion (Matthews 2003: 110). Similarly, the artificial platform construction at the Harappan-period city of Mohenjo-Daro would require 4 million man-days of labour (McIntosh 2008: 224). Such feats of organisation and their monumental end-result would symbolize an achievement that could only be possible within the context of a state organizational level, acting as a mechanism of legitimation for the socially stratified reality of the state. Apart from accentuating the leadership’s earthly power, monumental architecture would also propel its claims of privileged access to the supernatural and invest them with tangible, physical credibility. The aforementioned types of structures which were constructed to a monumental scale in all early states (albeit with different foci) are all marked by an overarching religious theme, either in a direct way or through the medium of the deified king (Matthews 2003: 121; Pollock 1999: 177; Trigger 2003: 541-2). Fortifications can be considered as an exception to the above rule since they are most commonly interpreted as symbols of the state’s power and military impregnability. In many cases, however, they were utilized as providers of exclusivity, rendering certain special areas as off-limits both physically and visually, thus mystifying the ceremonial procedures which were the prerogative of the upper classes and the king (Trigger 1993: 76-7; Trigger 2003: 133). The care invested in the visual result of monumental architecture in general acts as an additional argument for the ideological (rather than merely practical) role of these structures: Jeffreys (2010: 113-114) observes how there is an underlying distance–scale analogy in the cluster of the 19 Old Kingdom pyramids at Giza with the visual result of appearing as having an almost uniform size when seen from the centre of Memphis. Similarly, McMahon’s (2013) fieldwork highlights the fact that monumental architecture in Mesopotamia would not convey solely a monolithic message of power, but rather provided with a poignant and all-encompassing sensorial experience. Therefore, monumental architecture played an important role in the glorification of the king’s power, in the process of legitimizing his rule, and in providing a visual magnificence which reinforced the ideological convictions of the state. Its above role, coupled with striking evidence of a correlation between the consolidation of states and a progressive enlargement of monumental architecture (Trigger 2003: 564-5), leads to the question of the degree of importance it held in the process of state development. The existence of an integrating state ideology was an important prerequisite for the consolidation and sustainment of the state (Kemp 2006: 60; Pollock 1999: 173; Wenke & Olszewski 2007: 293; Yoffee 2005: 173-4). The way it utilized monumental architecture to institutionalize the dominant position of the élite which I explored above, was only part of its significance. For it has been argued that the level of socio-political complexity within a state could not have been maintained without the consent of the ruled. Was the state to emphasize conflict and coercion, then it would not have lasted for long (Miller 1991: 74; Pollock 1999: 173). Therefore, just as much as state ideology strove to justify the role of the ruler, it also vied to create symbols of unity and public identity. As it has been mentioned, religion and tradition constituted the bedrock of state ideology, for they provided it with the symbols and forms by which a spectrum of diverse societal groups could be represented. Based on these symbols a new, state identity could be created, which aimed at redesigning the dynamics of social relations in a supra-kin system (Matthews 2003: 121; Yoffee 2005: 37). If state ideology constitutes the grand regulator of these new relationships, identities, and realities which were created within the state, delineating the roles and responsibilities of both the rulers and the ruled (Yoffee 2005: 34), then I argue that monumental architecture is its greatest physical expression and a critical aspect of state development. Before I proceed with my argument, I want to clarify that I do not consider monumental architecture as a causal factor of state formation. I argue that the nature of the relationship between monumental architecture and state development, which is highlighted by the parallel course that they run in their evolutionary process, is a reciprocal one: as the state’s power augments, more elaborate monuments can be created, which will subsequently be sources of power themselves, into which the state can tap to further augment its own. Thus, monumental architecture is a vital component of state development and sustainment, but not of state genesis. It has been mentioned above, that state ideology had a multitude of vehicles for the distribution of its message – from artistic representations to literature works and celebratory ceremonies (Pollock 1999: 173; Yoffee 2005: 62). I argue, however, that monumental architecture was by the far the most poignant and critical element of the state ideology transmission and perpetuation process on the basis of two of its characteristics: on the one hand, its construction required the active participation of the state’s ruled, to which state ideology was actually targeted, creating a complex set of interdependencies; on the other hand, its material durability invested it with a unique sense of perpetuity. In contrast with royal art or literature, monumental architecture was not produced exclusively by a group of highly specialized artisans. While impressive feats of engineering and architecture(Trigger 2003:570-1) were required for the erection of structures such as the Egyptian pyramids, it was ultimately the lower classes that laboured en masse for their construction. Trigger (2003: 490) correctly observes how highly unlikely it is that the state’s lower classes blindly accepted the religious claims of the dominant élite: consent has already been stressed as a key concept for the development of the state, and that is exactly what I argue that monumental architecture effectively achieved. By including the commoners in the process of monument construction, and by placing a religious mantle over the end-result of their effort, monumental architecture constitutes the perfect convergence of the interests of the two basic elements of the state – the rulers and the ruled – and acted as the material form of the hitherto immaterial contract of consent and of agreement upon the state ideology’s convictions. Monumental architecture constituted the physical manifestation of the social interdependencies and compromises that ensured the development and survival of the state, and an actualized form of its ideology. For the ruled, the religious mask of monument construction rendered their participation an act for the “common good” (Pollock 1999: 181); their labour was a different (and additional) form of taxation to the ruler – and by extension to the gods – but one which contributed to the orderly function of the cosmos in a, both literally and metaphorically, concrete way. For the leadership, monumental architecture constitutes the next step in its accumulation of power and social status. But in order to achieve this step, the construction projects can no longer aim at its personal glorification alone. Therein lies the aforementioned compromise and interdependence. State ideology presents the ruler as the mediator between the gods and the people; his or her tomb or palace can be of monumental scale but only by embodying the religious symbols of the state, justifying his or her above role and securing the consensus and labour of the subordinates. The latter group will achieve the highest form of contribution to the gods by materializing its religious symbols on the grandest scale possible; but they have to compromise by providing the king with their labour and an implicit acceptance of his or her claims of religious and political supremacy. The second component of my argument which acts as an overarching, binding element to the above theory is related to the endurance of monumental architecture. Again in contrast with other forms of promotion of state ideology, such as royal iconography, monumental architecture is the most physically enduring testimony to a state’s power and ideological doctrines (Pearson 1999: 196; Trigger 1990: 122). The messages it disseminated, the events it marked, and the social roles and relations it sought to materialize, were underlined by the concept of perpetuity. Thus they would be visually and mentally carried throughout the life of the state, acting as a source of power, legitimization, and institutionalized convictions and behaviours, readily available to be tapped into and act as a regulator of interstate socio-political affairs. To support the argument I forwarded in this essay, I will turn to ancient Egypt and more specifically to the critical transition from the Predynastic to the Early Dynastic period and examine the evolution of mortuary architectural traditions. In the discussion of the early Egyptian state, monumental architecture and the relations among state ideology, leadership, religion, and labour which this essay explored, are primary expressed in the form of funerary monuments, rather than temples or palaces (which will be the focus of later periods). This special relationship between ancient Egypt and the funerary realm means that burials, their practices and architecture, constitute an abundant source of information on the state’s ideology and the evolution of kingship. This is particularly true for the period preceding the unification of Egypt and the first dynasties: the Predynastic or Naqada period which spans the 4th millennium BCE – until c. 3200/3000 BCE – and which was named after the largest known Predynastic site of Upper Egypt (Bard 2007: 94; 104; Kemp 2006: 95; Richards 2010: 62; Stevenson 2009: 1; Trigger 1993: 80-1). In most of the Predynastic sites, such as Naqada and Hierakonpolis, there is conspicuous evidence of social and economic differentiation predating by long the emergence of the Egyptian state (Köhler 2010: 43-45;). Many of the tombs of the élite cemeteries of this period were richly adorned with grave goods which elucidate the long-distance, exotic goods exchange systems which were at work and which invested their participants with prestige and social status: at the Hierakonpolis cemetery of Wadi Abu el-Suffian, Tomb 11 yielded impressively rich amulets crafted out of gold, silver, carnelian, lapus lazuli, and other valuable materials (Bard 2000: 61; Bard 2007: 97; 100; Stevenson 2009: 4). This and most of the tombs are also lined with mud-brick, which becomes a ubiquitous feature of high-status burials as we approach the Naqada III period (c. 3200 BCE) (Stevenson 2009: 3 Despite their wealth and elaboration, the basic form of the Predynastic tombs remained that of a rectangular or oval subterranean pit throughout the period (Bard 2007: 97; Stevenson 2009: 2). Many of them covered an impressively large area and were comprised of a multitude of chambers: a characteristic example is the Naqada III period Tomb U-j at Abydos, which had 12 chambers and extended over an area of 66.4 sq.m. (Bard 2000: 64; Bard 2007: 108). In this and other tombs, evidence of some kind of superstructure exist but not of a consistent form or elaboration as their investiture continues to concentrate on their subterranean part (Bard 2007: 108; Stevenson 2009: 3). It is only in relation to the tombs of the 1st Dynasty period and onwards, that we begin to witness architecture of truly monumental elaboration and size. One of the earliest tombs of the mastaba type, which were the first to be marked by an impressive niched superstructure, at the site of Naqada, yielded seals with the name of the first king of the 1st Dynasty Aha, relating it thusly to the advent of the Dynastic period (Bard 2007: 97; Köhler 2010: 46; Maisels 1999: 65). Along with the increasing elaboration of the tombs’ superstructures, during the early Dynastic period is when the first impressive royal funerary enclosures make their appearance as well: the complex of Khasekhemwy was surrounded by an enclosure wall that covered an area of 124 x 56 metres and is preserved to a height of 11 metres (Bard 2007: 115). It is also a period of innovations: the tomb of the 1st Dynasty king Den included a staircase which allowed the whole tomb to be constructed prior to the burial of the king, while it presents the earliest evidence of use of the hard-to-quarry red and black granite from Aswan (Bard 2000: 72; Bard 2007: 113). Lastly, despite the fact that only during the reign of the 3rd Dynasty king Djoser did the true pyramid make its appearance, there is evidence that the subterranean tombs of six kings of the 1st Dynasty at Abydos were covered with mounds (Bard 2007: 110). The significance of the latter is related to the metaphorical significance of the mound as a symbol of creation and rebirth – an important symbol which was subsequently reproduced, most notably, in the form of the pyramid (Kemp 2006: 103). The above examination of the evolution of mortuary architecture in the critical period of early Egyptian state development is related to the points which this essay addressed in two levels: the material and the symbolic. The basis for both is a conspicuous pattern which emerges from the above study: with the turn from the Predynastic to the Dynastic period, there is a sudden concentration on providing tombs with superstructures – impressive, symbolic, and most importantly, visible. On the first level, there is a relation between the increasing power of the ruler and the emergence of above-earth tomb elaboration. The visual significance of monumental architecture was addressed in the first part of this essay. Tombs were meant to convey the material power of the king and act as a perpetual reminder to his or her superhuman nature as the mediating link between gods and earth, while the massive enclosures would provide the outsiders with a feeling of mystification. Trigger’s approach to monumental architecture is of interest in this case as well. In an article, he suggests that the significance of monumental architecture stemmed from the perspective of energy expenditure, which he considers as a universally understood principle especially in early societies wherein energy was primarily spent for subsistence, rendering the non-utilitarian energy expenditure on monumental architecture the grandest form of élite “conspicuous consumption” (Trigger 1990: 124-5). Through this approach, a connection between the advent of the dynastic period and the emergence of visible tomb superstructures is elucidated: the visibility of energy consumption – which latter was multiplied by the shift from mud-brick to stone as building material (Harrell 2012: 2) – would have greatly added to the king’s power. On a second level, and in support to the argument I forwarded on the second part of the essay, there is an inextricable connection between the emergence of tomb superstructures and the creation of monumental symbolism – most notably the aforementioned “mound” symbol. Taylor (2010: 222) makes the interesting point that the belief system that underpins burial practices does not vary greatly from the lower to the upper classes of Egypt – only the expenditure and elaboration does. Therefore, to return to my original argument, monumental architecture of the scale and elaboration that developed in early states, could not have been possible without a simultaneous adoption of an overarching religious symbolism, which would provide the swathes of labourers who worked for its construction with the sense of contribution, unity, and identity, but also secure their consensual participation. The significance of monumental architecture in the study of early states has been amply corroborated throughout the present study. In the first part, I explored its significance particularly in regard with leadership and state ideology. The latter was explained as the efforts of a powerful minority to institutionalize both social inequality and their dominant positions, and impose them to the subordinate majority as a natural way of societal organization. Monumental architecture in the service of leadership acted in two ways: on the one hand, the scale and elaboration of these monuments emphasized the king’s level of control over resources and labour; on the other hand, the religious overtones of the nature of these monuments would provide the state with symbols of unity and identity while accentuating the king’s role as the link between the gods and the common people. In the second part, I supported the argument that monumental architecture can be considered as a critical component of the process of state development. Having stressed the vital role of a state ideology in the development of the state, I argued that monumental architecture constitutes by far the most effective form of distributing and perpetuating it, on the basis of two fundamental characteristics. First and foremost, the swathes of labourers which state ideology seeks to integrate are, in the case of monument construction, actively engaged in the process. This creates a complex situation wherein monumental architecture becomes an endeavour of interest for both the rulers and the ruled, creating a vital and binding set of interdependencies. The ruler achieves the grandest form of monument construction but not before relinquishing any personal glorification overtones of the end-result. Rather than being a monument to the earthly ruling individual, monumental architecture is a glorification of the divine ruler – the mediator between gods and earth and the guarantor of order – of the faceless office. This is what will secure the labour of the second group – the ruled – whose consensual participation is inspired by the sense of actively contributing to the maintenance of cosmic order through the construction of monuments of religious significance and great scale. As the interests of both groups converge, and monumental architecture takes form, so the silent contract between the two groups crystallizes, ensuring the successful sustainment of the state. The case study sought to exemplify the points which were risen throughout the essay. I demonstrated that in the transitional period that led to state formation and the first dynasties in ancient Egypt, the evolution of mortuary architecture does not initially present a pronounced change in scale; rather, there is a change of focus from the subterranean, to the visible and symbolic elaboration of burials which elucidates the underlying and inextricable link between state development and the symbolic nature of monumental architecture. A typical 'mastaba' type of tomb with a niched superstructure. This particular tomb belongs to King Shepseskaf of the 4th Dynasty. Jane E. Francis and Anna Kouremenos (eds. 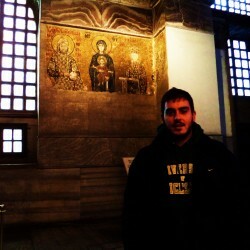 ), "Roman Crete: New Perspectives"
by by Georgia (Zeta) Xekalaki Archaeologist - Egyptologist, Ph.D.